You would think, that after 11 years of living in Wichita, I would cease to be surprised about things. 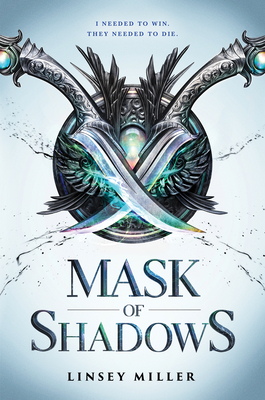 And yet, soon after beginning Wichita State MFA student Linsey Miller's debut novel, Mask of Shadows, I found myself both surprised and delighted: being a picky fantasy reader, it's not often I pick one up head over heels for the characters, the world, and the whole book. Sal Leon is many things: a refugee from war, the only survivor of a fallen land; a thief; ambitious; reckless; and set on revenge for the lords who were responsible for the deaths of an entire country. The problem is that Sal has no access to those lords... so when Sal comes into the possession of an audition poster for the Queen's Left Hand -- a group of highly trained assassins in the service of the queen -- Sal decides to take the chance. But little do the auditioners know that the trial is to the death, and that there will be many obstacles in their way. To get this out of the way: Sal is gender fluid -- sometimes a she, sometimes a he, and sometimes a they, as Sal puts it -- and while the gender fluidity is part of the story (Sal was often annoyed when people didn't get their gender; they did what they could to help people "get" it, but some characters were willfully obtuse), it wasn't the entire story. In fact, there was so much to love! Miller has done some incredible world building, parsing out enough information to help the reader understand the world, but not going into long tangents about the history (though there is one attached at the end, if the reader is interested). There was magic, but that was banished, which leaves for some intriguing subplots (and maybe some more exploration in the sequel? ), but that doesn't play a huge role in the narrative. Instead, this is a survival story: Sal needs to survive the trials and become the new assassin if they want to enact revenge for the systematic murder of their people. It's written in first person, and Sal's life/head is a good place to be: they are a smart, intuitive, and creative survivor. The book is also populated with a lot of fantastic secondary characters, from the servant Sal gets when they join the trials to the other members of the Left Hand. It's a brutal book: in a trial to the death, there is bound to be people killed that the reader cares about. All that gives it heft, though, and shows that Miller's not afraid to tell the story that needs to be told. An excellent debut novel, and I can't wait to read the sequel.